Len McCluskey is not naïve, his doing the best he can in the sewage of UK politics today ! 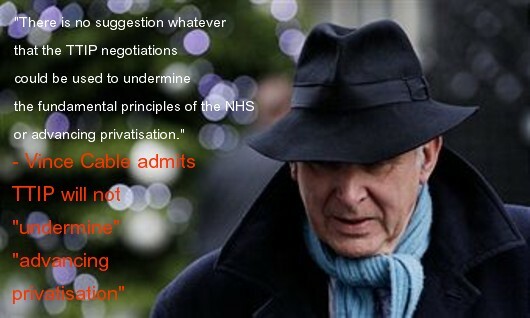 The Tories have been planning the privatisation of the NHS for a very long time. Thatcher commissioned a report looking into it, but then suppressed it, realizing it constituted political suicide. And I can remember Davids Steel and Owen when the Liberals and Social Democrats were merely an alliance, rather than the same party, stating that it didn’t matter whether the health service was private or public, so long as it was free. Well, it works much better when it’s state owned, and as a private industry it most definitely won’t be free. Tories like Peter Lilley, Jeremy Hunt and IDS despise it because it is free, and so excludes the private sector from making a tidy profit. Now, a thought occurs to me: What happens if a Country turns up to a TTIP hearing and tells the plaintiff corporation to straight up F off and just completely ignores the power of the TTIP tribunal? Let me see – sanctions for 100 years so all the children die or bombing with white phosphorus or depleted uranium for good measure or just plain drones followed by invasion by the un. This government will never rest until it’s ruined our National Health Service.